The Coronado is the larger brother of the Catalina. We build it to accomodate the more capacious user with a wider waterfall seatpan and a wider and taller back. With traditional ergonomic shape and upholstered with premium vinyls or classic fabrics, the Coronado can fit in with most office spaces. 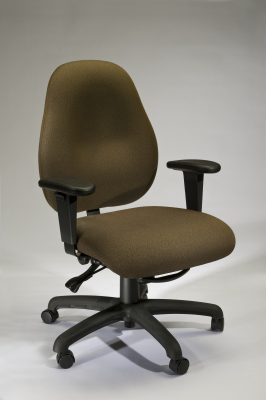 It has features identical to its sibling Catalina chair – back height, seat depth, seat height, back angle, and seat angle adjustments. This chair can also be shipped partially KD'd, in order to save shipping costs, and can be reassembled in minutes without using tools. Seat Depth: adjusted by lifting the front left lever, which controls the sliding seat mechanism. Fully upholstered seats and backs eliminate scuffs on walls and scratches on chairs that commonly occur with plastic chairs.